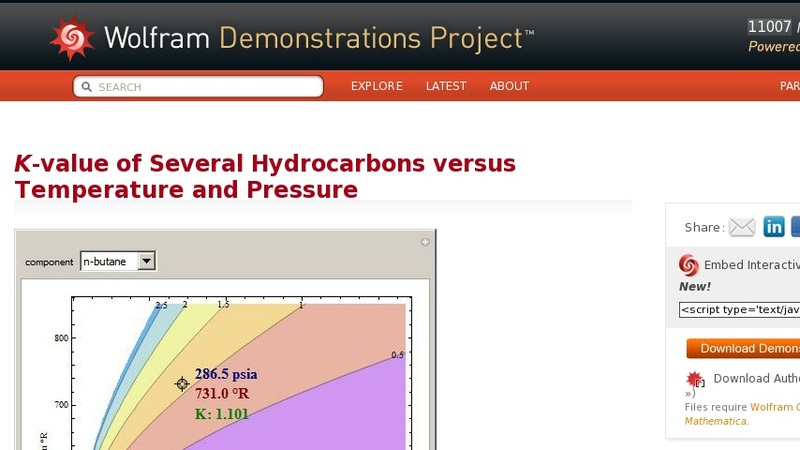 This Demonstration shows the contour plot of ... versus temperature expressed in °R and pressure expressed in psia, where ... and ... are the mole fractions of component ... in the liquid and vapor phases, respectively. For many systems, ... -values are approximately independent of composition and we have ... . For light hydrocarbons, the approximate ... -values can be determined from DePriester charts, which have been fit to the following equation: ... , where the constants ... , ... , ... , ... , ... , and ... are tabulated . Drag or click the locator to display the values of the temperature and pressure as well as the ... -value for various light hydrocarbons.